Start off your visit on the 26th (Fri): steep yourself in history at The Huntington Library, Art Collections, and Botanical Gardens and then contemplate the waterfront views at Santa Monica Bay. Keep things going the next day: admire the striking features of Watts Towers, tour the pleasant surroundings at Hermosa Beach Pier, and then enjoy the sand and surf at Manhattan Beach. For where to stay, reviews, photos, and tourist information, refer to the Los Angeles itinerary builder. New York City to Los Angeles is an approximately 9-hour flight. You can also drive; or take a train. You'll gain 3 hours traveling from New York City to Los Angeles due to the time zone difference. While traveling from New York City, expect somewhat warmer days and about the same nights in Los Angeles, ranging from highs of 75°F to lows of 58°F. Wrap up your sightseeing on the 28th (Sun) early enough to travel to Seattle. 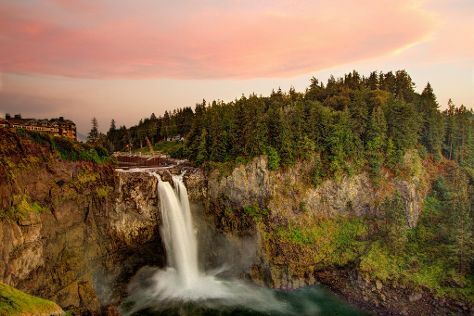 You'll discover tucked-away gems like Snoqualmie Falls and Hiram M. Chittenden Locks. You'll get in some beach time at Alki Beach and Golden Gardens Park. Step out of Seattle with an excursion to Point No Point Lighthouse in Hansville--about 1h 15 min away. The adventure continues: tour the pleasant surroundings at Kerry Park, meet the residents at Woodland Park Zoo, admire the striking features of Seattle Public Library-Central Library, and get in on the family fun at Seattle Great Wheel. To see reviews and tourist information, read our Seattle trip itinerary maker. Traveling by flight from Los Angeles to Seattle takes 4.5 hours. Alternatively, you can drive; or take a bus. In May, Seattle is a bit cooler than Los Angeles - with highs of 65°F and lows of 49°F. Wrap up your sightseeing by early afternoon on the 1st (Thu) to allow time for travel back home.